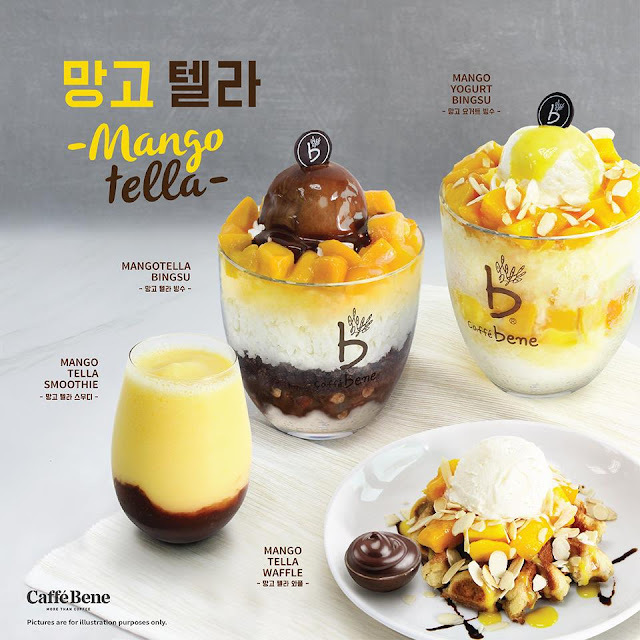 Presenting Caffebene's latest indulgence - Mango + Nutella! If you've yet to try this combination, I highly suggest you to! Nutella has been the world's favourite when it comes to a chocolatey hazelnut spread. Along with the vibrant taste of mango, the combination truly works. Though to be honest, it sounded weird the first time I heard about it. There are 4 new items from Caffebene, 2 Bingsu, 1 smoothie & 1 waffle. Starting with the Mango Yogurt, this Bingsu has a nice blend of fresh mango fruit, mango sauce, shaved iced, almond nuts, and finished with yogurt ice cream. It's quite a nice mix, but I personally prefer the Nutella more. This one portion is able to feed up to 2-3 pax! Now this my friend, is what I've been waiting for. A generous amount of Nutella topped on freshly cut mango & shaved ice, finish with a scoop of chocolate ice cream. It truly is a dessert worth saving my stomach for. As the days in Malaysia are getting hotter, a good bowl of Bingsu really does help with cooling my body down. A simple smoothie - nothing too fancy, just good ol' Nutella layered with a good amount of freshly-blend mango smoothie. Available at ALL CAFFEBENE Outlets in Malaysia!